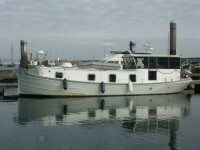 Designed by Nick Branson and built by Will Trickett Boats Ltd in 2011. This vessel has had no expense spared on the build quality or the interior finish. 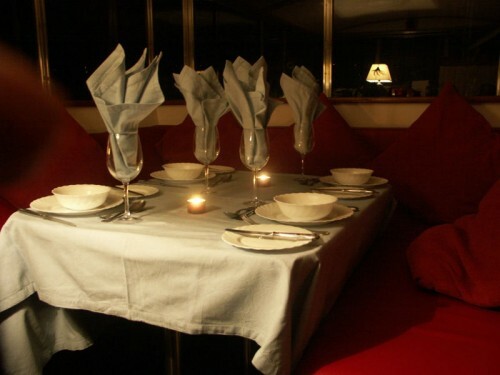 Beautiful solid aged teak and solid oak wood has been used and this is complimented with red leatherette seating. 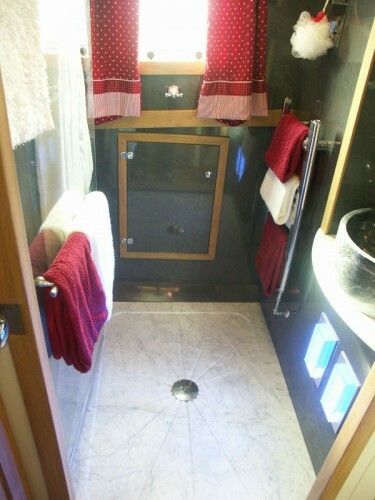 It features a solid granite hand basin and Italian marble to the floors in the wetroom, head and galley work tops. Featuring special LED light fittings and switches, tinted glass windows, excellent electrical onboard systems, quality appliances and great attention to detail is shown throughout. 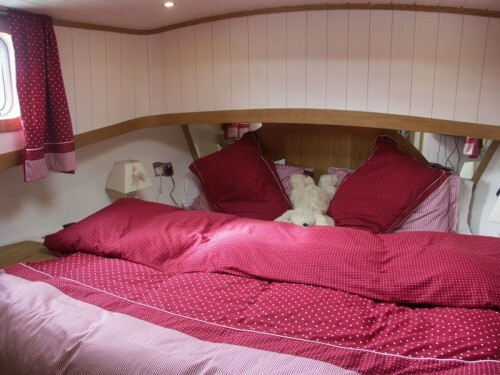 Specifically designed to offer luxury extended cruising for two people with visitors who can be accommodated on the king size berth in the collapsible wheelhouse. This Category C approved vessel is ideally suited for cruising on coastal waters, rivers, UK canals and European waterways. If you can get everything for your boating experience and pleasure into 40ft, why drag around more?? 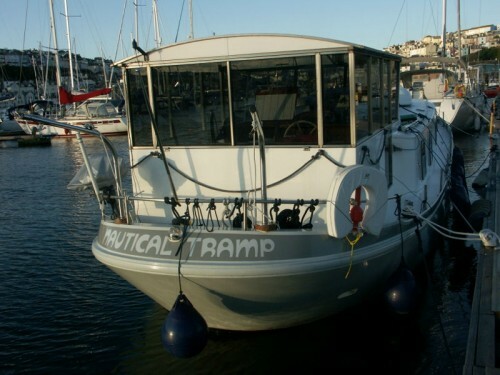 This innovative design marries Inland and Coastal Boat Technology to create luxurious living for up to 5 adults or 4adults and two children in a particularly manoeuvrable boat with the added financial benefits of lower marina/ mooring fees, cheaper running costs, river/ canal licences, fuel, heating and maintenance costs. 8 domestic Gel batteries. 1 engine Gel battery. 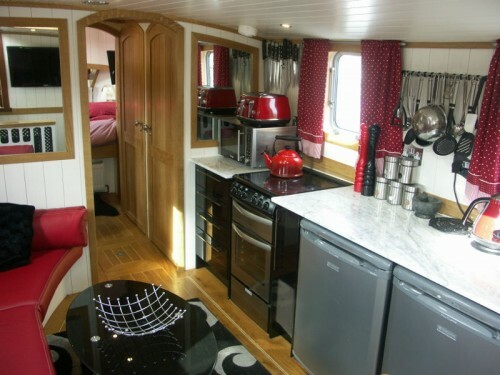 The wheelhouse windows and roof have been design to be removable to enable a lower airdraft of 7′. Erected the airdraft is 10′. 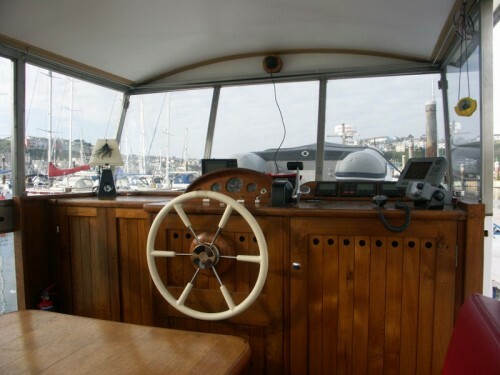 Wheelhouse finished with solid aged teak wood and oak trim. Saloon floor, steps and trim in solid oak. The latest warm LED lighting throughout and also blue LED mood lighting. Esberspacher central heating system with four radiators. Hot water supplied by engine, immersion heater and 240v shore power. TracVision twinLMB dual station satelite TV receiver with connectivity throughout EU, UK and Mediterranean regions. 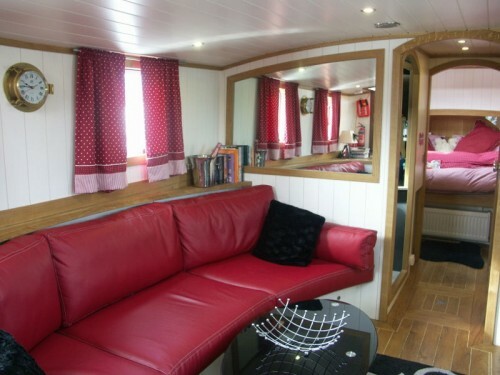 Master cabin with Superking double berth. 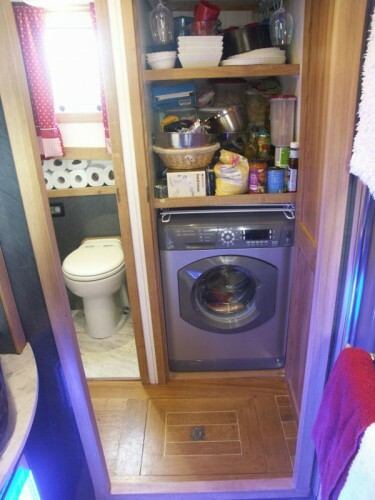 Single berth utilising saloon lounge. 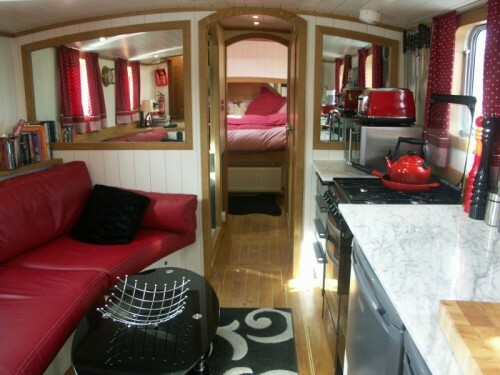 Wheelhouse seating converts to a King double berth. Wetroom Shower with heated towel rail is finished in Carrara Bianco marble and granite basin. Separate toilet compartment with electric pumpout to shore station and also seacock for ocean venting. “A+” rated energy saving galley appliances.